Fourth Row Center: Film Writings by Jason Bailey: On DVD: "B.B. King: Live at Montreaux 1993"
B.B. King is something of a mainstay of the world-famous Montreaux Jazz Festival; he first played there in 1979 and has since appeared nearly 20 times at the music fest on the shores of Lake Geneva. 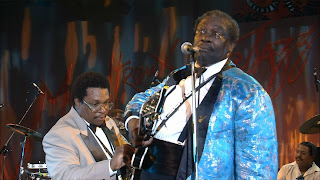 The new Blu-ray B.B King Live: Live at Montreaux 1993 captures King, his guitar Lucille, and his excellent band as they perform a marvelous 99-minute set at the 1993 festival. After decades of performance, the man knows how to make an entrance—the first couple of numbers are nicely up-tempo mood-setters, in which his fine band takes turns soloing in preparation for the headliner. When he comes in, there’s a funny speed bump when he starts to play before they’ve plugged Lucille in (he takes it in stride); once he’s plugged in, off he goes. I’ve seen a number of music DVDs that would work just as well without the image; it’s a kick to hear a talented performer live, but the visual often doesn’t add much. That’s not the case here. Not only is the concert noticeably well-shot and rhythmically cut, there is a real joy in watching B.B. perform—the way he talks with his guitar, how he screws up his face, squeezing his eyes shut before popping them wide open on a particularly hot riff. Resplendent in a patterned, powder-blue tuxedo jacket, he knows how to work his crowd; in the midst of “Let The Good Times Roll,” when he barks out, “B.B. King’s in town!”, they go bananas. His vocal highlight may very well be his take on “Since I Met You Baby”—he sings it full-out, to the walls, loaded with emotion, and all I could think was, “This is the blues.” The vocals on “Please Accept My Love” are awfully good as well; he smoothly sings the verse, almost in a croon, before letting his voice rip on the chorus. The interlude where, in preface to “Blues Man,” his pulls up a stool and talks about his 42 years (to that time) in show business is charming and intimate. And he has the good sense to close the show with an extended rave-up rendition of “The Thrill Is Gone,” complete with band intros and a fine play-off. It’s a stellar closing to a splendid concert. B.B King Live: Live at Montreaux 1993 is a smooth, slick, professional blues program, featuring one of our true modern masters. It never quite catches fire the way some of the best in-concert films do, but the decades-sewn craftsmanship and honest-to-goodness soul and emotion of King and his crew make for a thoroughly entertaining, tremendously enjoyable package. "B.B King Live: Live at Montreaux 1993" is currently avaiable on DVD and Blu-ray.